Whether or not you collect Martha by Mail products, you have to admire the uniqueness and quality of the merchandise that was once offered through this exclusive catalog. As a longtime collector, I can attest to the excellence of the fine china, glassware, stoneware, earthenware, porcelain, copper and enamelware, that I use on a weekly basis. To my mind, not one piece of what I have looks dated or worn out. It all started when my husband and I moved into our first home back at the turn of the millennium. I remember wanting the best of the best for our abode, so naturally I turned to Martha Stewart for guidance. Yes, I did purchase many things from Martha Stewart Everyday through Kmart (I have all of it to this day), but it was Martha by Mail which I considered la crème de la crème. Pricey, to my mind at the time (although in hindsight, everything was a steal! ), I began to order from the catalog in earnest. There wasn't a month that went by when something wasn't arriving in the mail from MBM. That so many of these products have withstood two decades of constant use, displaying and photographing in my home, leads me to believe that they will endure many more decades to come. My collection of Martha by Mail cutters. There are three types of collectors in this world. First, there is the person that displays a collection for the sole purpose of admiring it; this person will have everything in its original packaging, and will keep it as if it were purchased just yesterday. The second type of collector will use their collection(s) on a regular basis, not bothering with displaying things in a specific manner. The third type of collector is a mixture of both. I tend to fall into the last category. Whatever I own from Martha by Mail has a specific location throughout the house. I like to make sure that everything is in its proper place, and I like to make sure that I have access to it. This way I can locate something and use it whenever I need it. 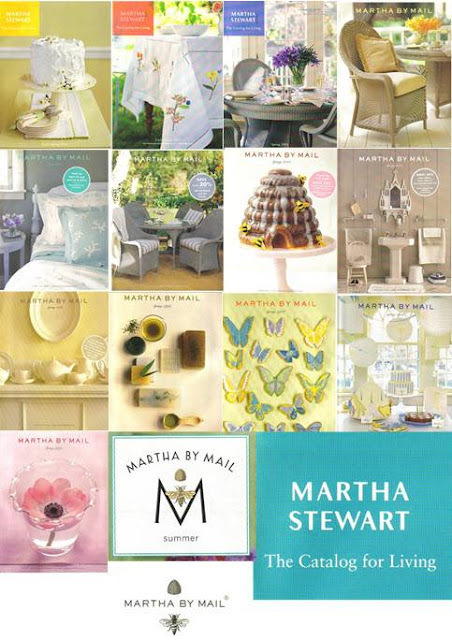 Everything you see in this post is from my personal collection of Martha by Mail. Just about every single product that came from the catalog had its own instruction card, recipe card, information card or pamphlet. Martha by Mail was very meticulous about giving the consumer as much information as possible about what they were buying. If you're a collector of MBM, then you will understand how important these cards and pamphlets are. When purchasing a MBM item at auction or at a sale, the pricing of said object will command a premium if the original information card is included. 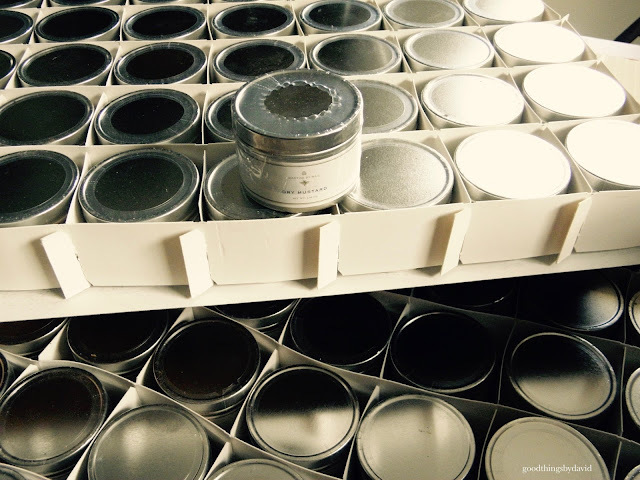 My spice rack is one of those cherished items that I will probably always display and use in my kitchen. It never fails to draw attention from visitors when they walk into my home. Its simplicity and style makes it suitable for a variety of kitchens. Way back when, this is how the spice tins came in the mail. They were packaged in two layers and were shrink-wrapped to guarantee freshness. As you can well imagine, the spices alone were rather pricey. This is perhaps one of my favorite photographs because it contains everything I love. 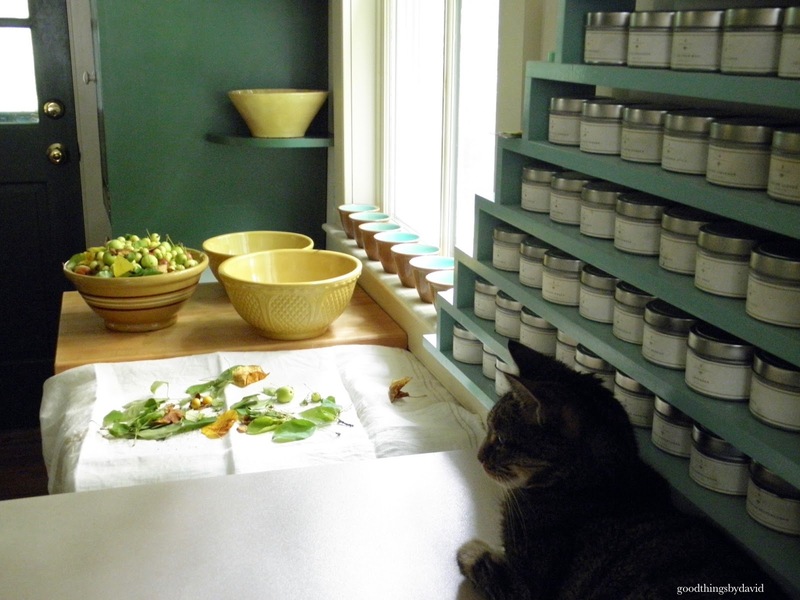 My late cat, Ms. Kitty, loved to rest near the spice rack. She felt safe and secure being perched here because she could observe everything that was going on in the kitchen. I miss her greatly. Wirework can be traced back to seventeenth century Slovakia. It is there that ironmongers began the art of mending broken pottery. From that point on, craftsmen embarked on weaving rolls of wire into everyday items for a more savvy consumer. 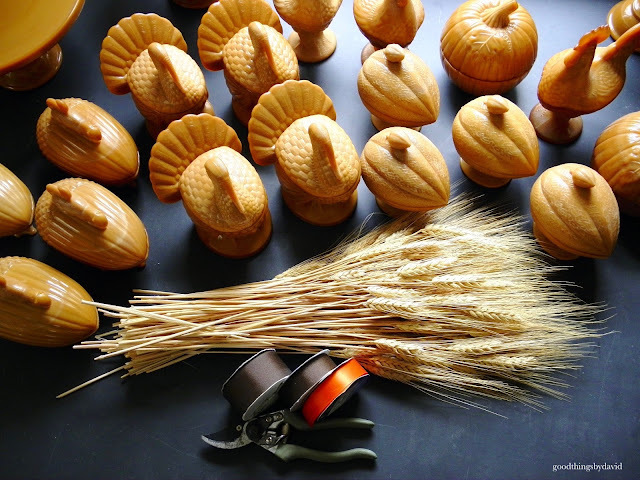 Everything from birdcages, toys, vases, baskets, trays and cooking implements, appeared at markets, department stores and even on street corners. During the turn of the twentieth century, wirework objects reached their peak in popularity, both in Europe as well as in the United States. 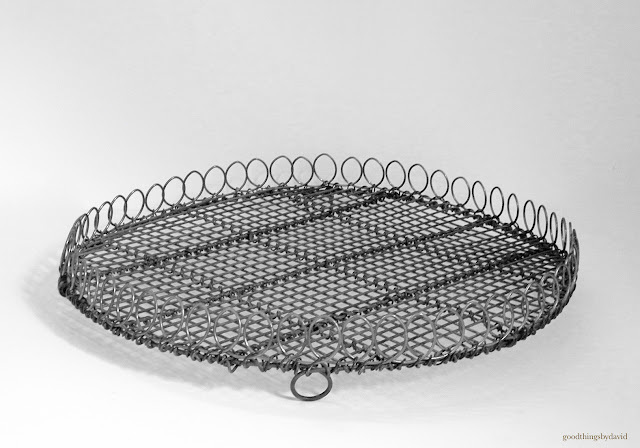 It's through Martha's collection of wirework wares that MBM created their very own version of two very popular items: a round and rectangular cooling rack/tray for baked goods. These models were available for a very short period through MBM. 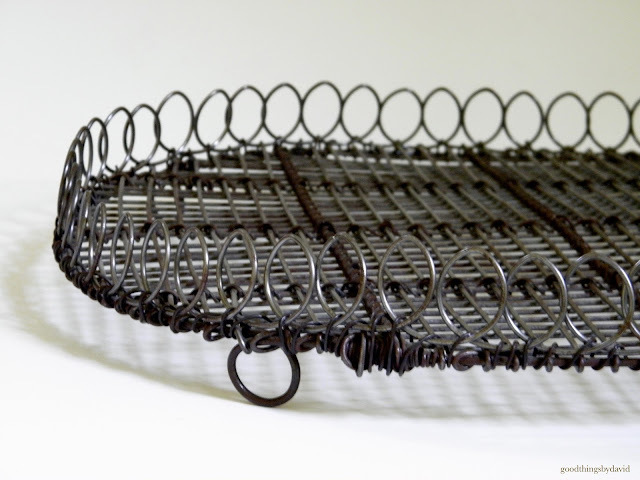 This round wirework tray/rack is one that I cherish because it is unique and very well made. You can see the crisscrossed rods of thicker wire that span the diameter of the base. Thinner gauge wire is weaved in a grid pattern along these rods. Wire loops are attached along the border and underneath the tray. If you look closely, you can see how well the wires are woven along the circumference of the round. It's amazing to me that someone actually took the time to weave these by hand. People have asked and asked if I know the source of these MBM wirework trays, but alas, I do not. 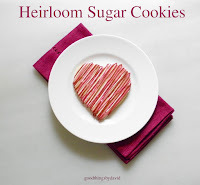 Decorated sugar cookies look especially enticing on these trays. I love how this tableau looks. A rectangular MBM wirework tray. 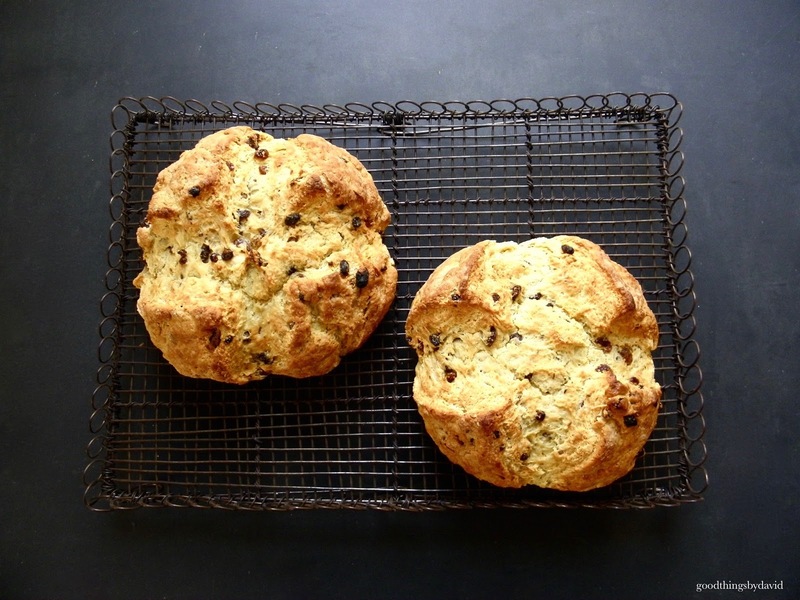 If I'm in a rush to cool something hot coming out of the oven and I don't have one of my commercial cooling racks handy, I'll grab my MBM ones instead. They work like a charm. If you're lucky enough to have MBM wirework trays, keep them. They are beautiful and bound to become heirlooms. That so few of them ever come up for auction speaks of their scarcity. There were several sets of mixing bowls that were made for the catalog from some of America's pottery works that were in existence at the time. 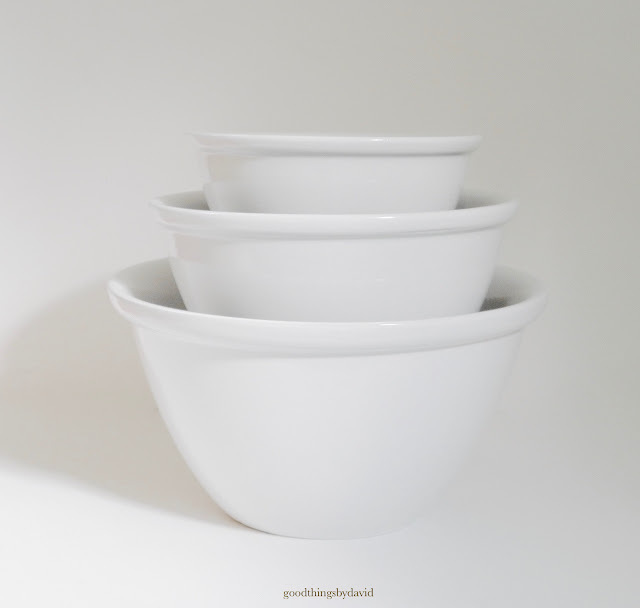 I find it so difficult these days to find good quality stoneware mixing bowls, which leads me to collect the vintage variety. 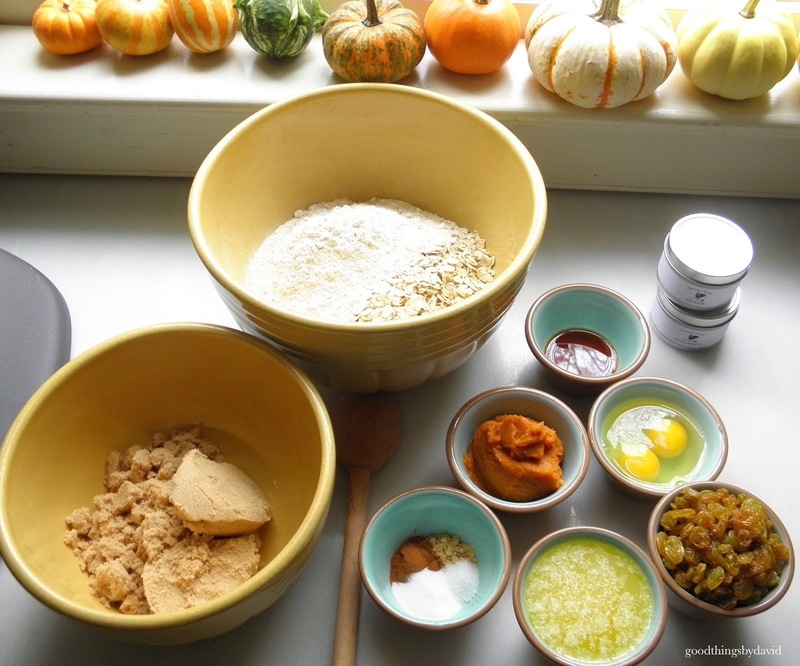 I don't own every single mixing bowl that was made for MBM, because I am rather picky. I like a bowl that is unique, well-made and not too ornate. The ones above are my favorite ones. 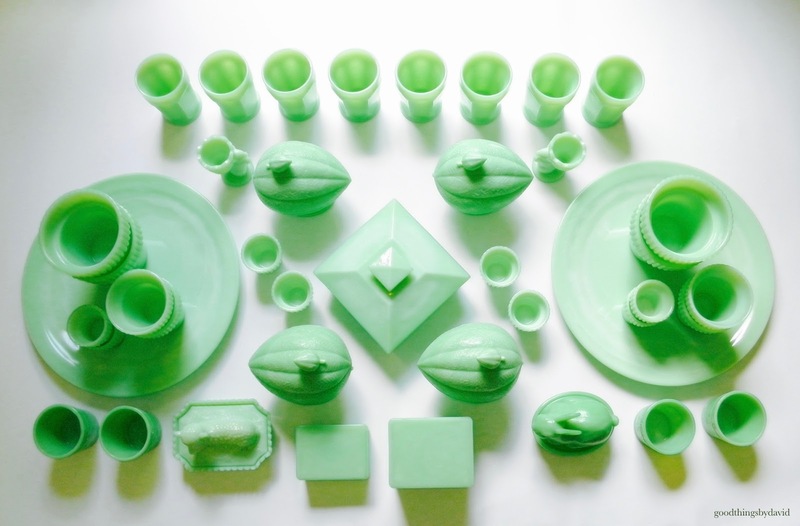 Here we have pictured, the Extra Deep Mixing Bowls, the Porcelain Pudding bowls, the Diamond Stoneware Bowls, the Great Big Mixing Bowls (in yellow and white) and the sage-green Stoneware Nesting Bowls in that 'beehive' design. If you have these then you will know that I am missing one important bowl from one of the sets. Can you guess which one? These were referred to as the Extra Deep Mixing Bowls. The shape of the bowls is what captivated me from the very beginning. The smallest is 7-1/2" in diameter, the medium one is 9-1/2" in diameter and the large one is 11-3/8" in diameter. Although they are marked Martha by Mail underneath each bowl, these were not made in the United States. MBM sourced a pottery works in Portugal for this set. They are heavy and made to last a lifetime with proper care. To think that I used to own two sets of these! 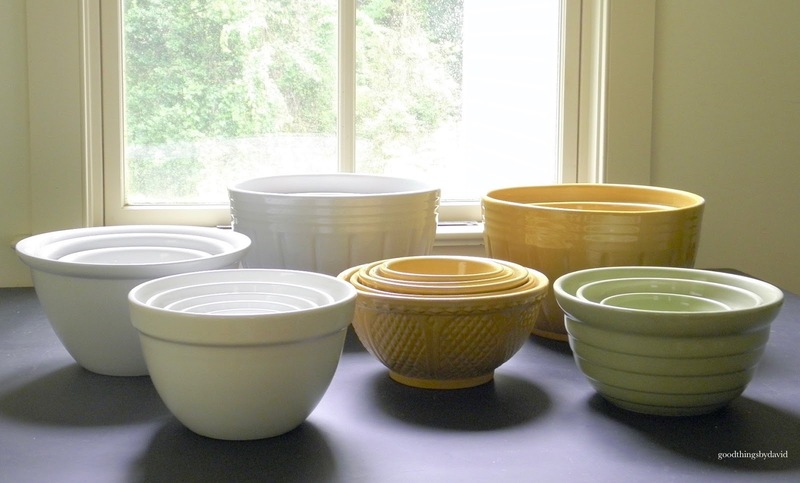 The Great Big Mixing Bowls were made in either a yellow or white glaze. 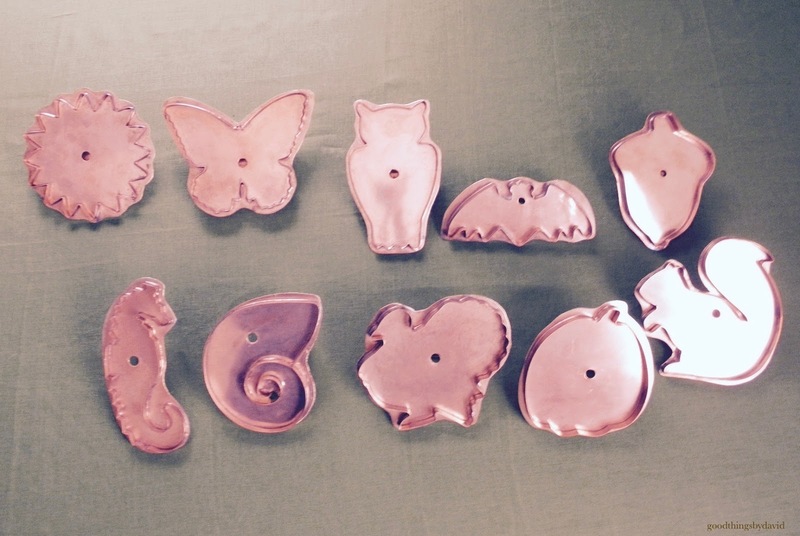 They were handcrafted by skilled potters at the former Robinson Ransbottom Pottery of Ohio. The small one measures 8" in diameter, the medium is 10" in diameter and the largest is 12" in diameter. It's sad that this pottery works is no longer around. I will say that what came out of that place in the hundred years that it was in operation is nothing short of top notch. 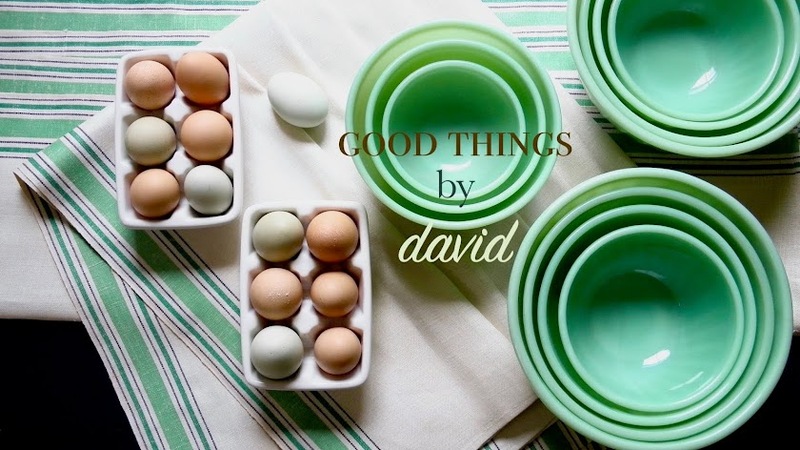 I use my great big mixing bowls constantly. 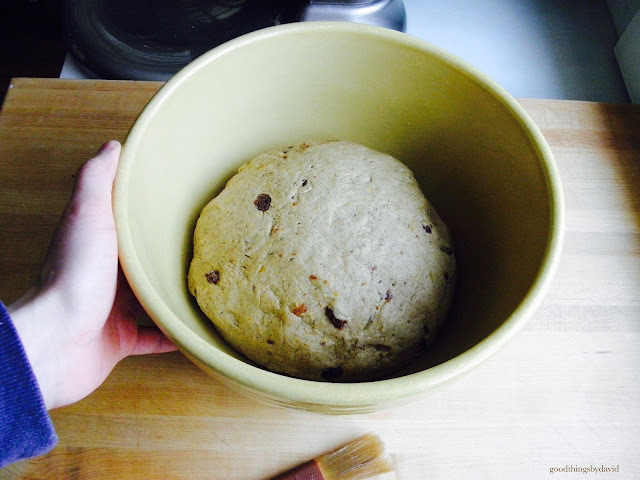 My Swedish Limpa is proofed for its first rise in one of these bowls every single time I make it. All of the MBM bowls in my collection are ones that I could never part with. Colored glassware was synonymous with Martha by Mail. States the catalog: "Our interest in pressed glass began with Martha's own collection of early twentieth-century green glassware. 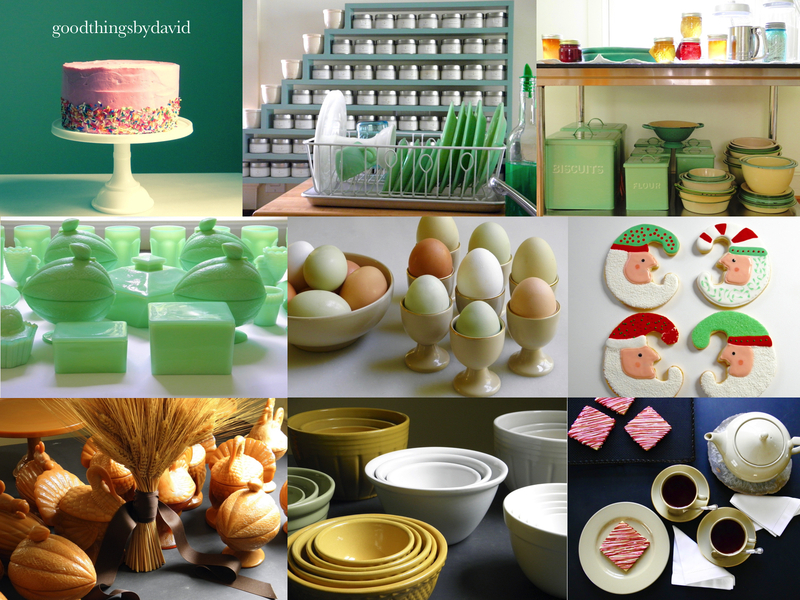 Over the years, we've reinterpreted some of her favorite pieces, first in green, and more recently in milk, pink and caramel. Our glassware is created by hand using traditional methods at three of the remaining glass factories in the United States. The selection is more extensive than the best flea market or antiques show; many of the items are available exclusively through Martha by Mail and are created using original long-forgotten molds we've brought back into production. 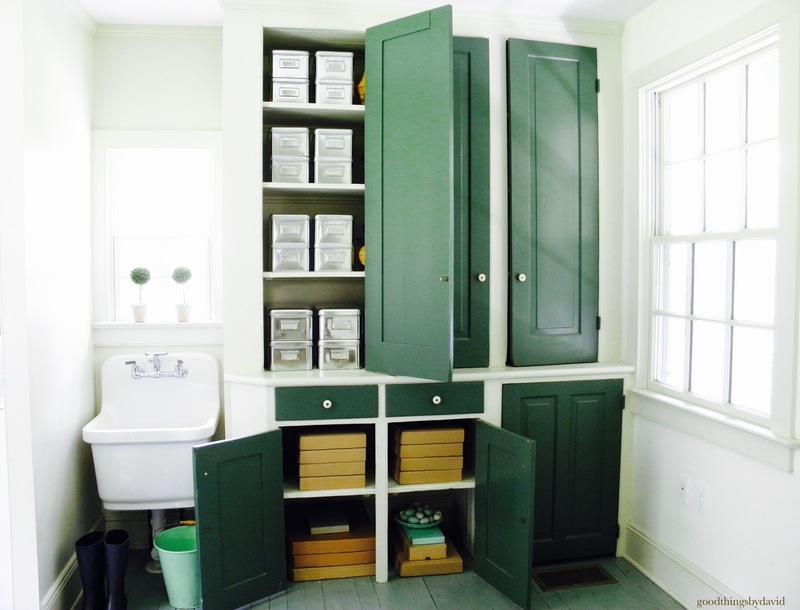 Subtle gradations in color make each item one-of-a-kind collectible you'll enjoy for years to come." Again, I don't own every single piece of pressed glassware that was available through MBM, but what I do have is greatly cherished. I absolutely love the shapes, the subtleties in color and the quality of everything. From tumblers and small flowerpots, to refrigerator dishes and other covered figural vessels, each piece is used with great care at my house. I never put any of the colored pressed glass through the dishwasher. 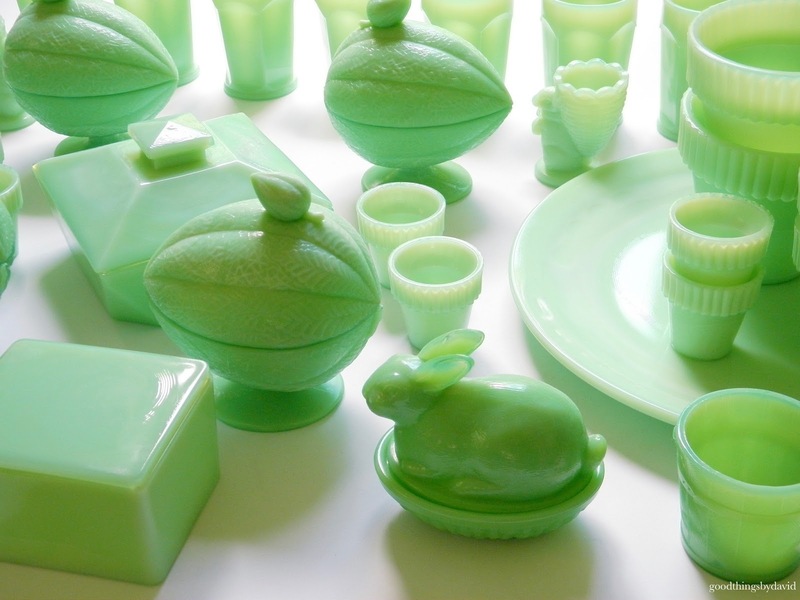 In the morning light, this jadeite seems to glow. 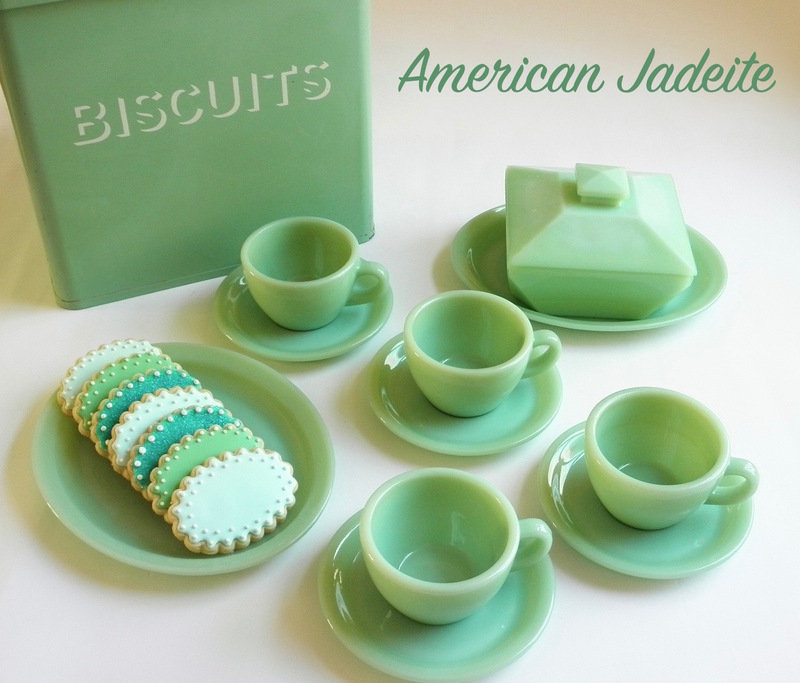 Many die-hard collectors of old jadeite will tell me that this isn't truly jadeite. Guess what? I don't really care. 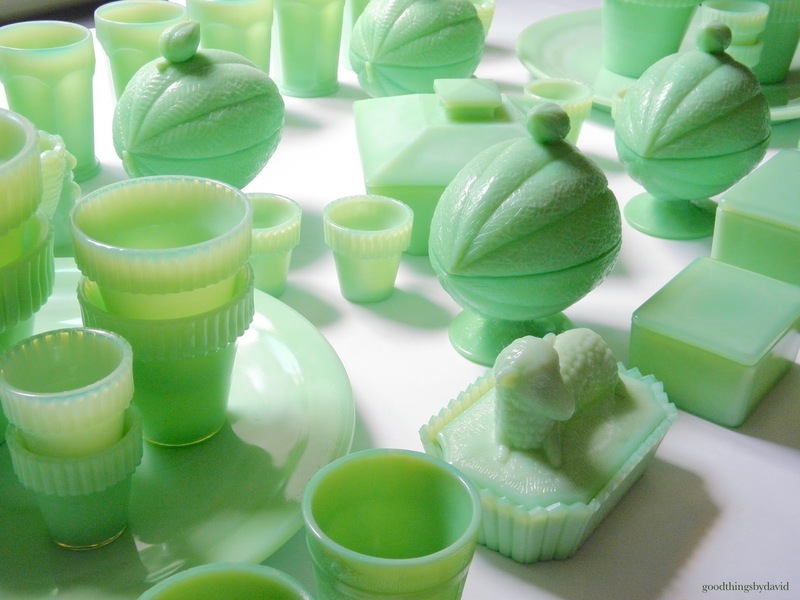 I see it as unique, beautiful and important in the jadeite spectrum of colored glassware. Look at that adorable lamb lying on a bed of grass atop a picket-fenced basket. The original mold for this piece came from the Westmoreland Glass Company of Pennsylvania. Practically down the road from where I live! I don't know if I like my MBM caramel glass more than I like my MBM jadeite glass. How can I pick a favorite when they're both equally beautiful? 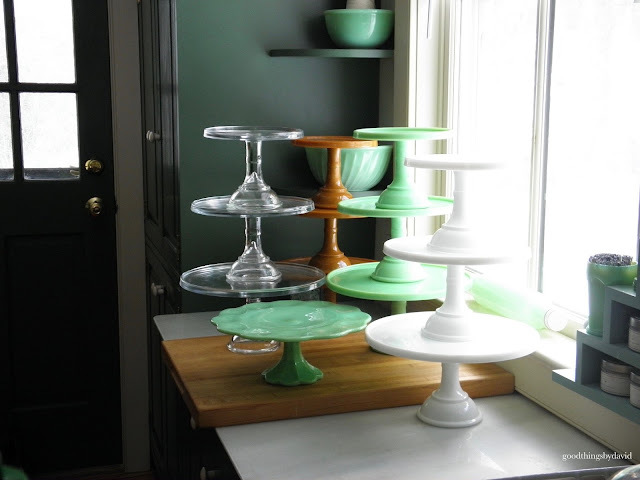 The caramel (slag glass) pressed glass items that were made for MBM included covered dishes (above) and cake stands only. 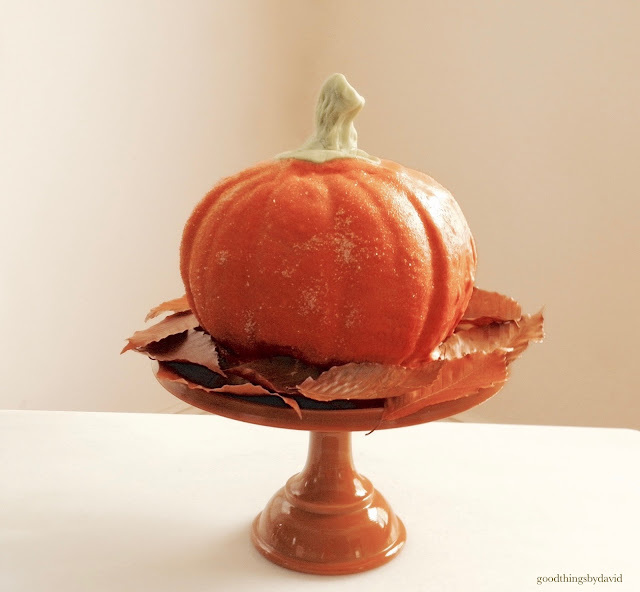 This particular shade of glass looks spectacular for a Thanksgiving or Fall table setting. 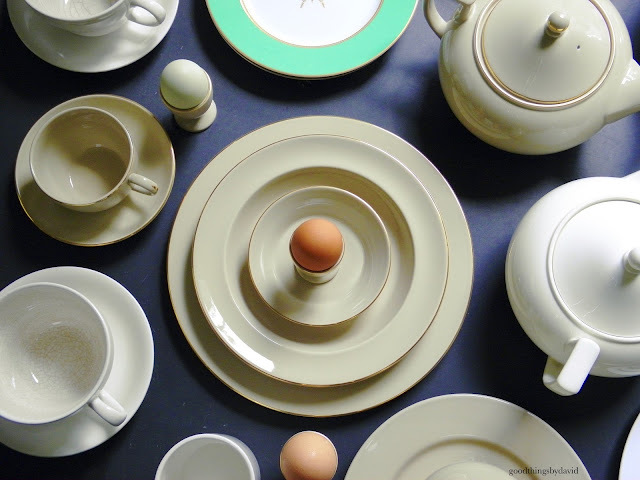 Mixed with Wedgwood drabware (also Martha by Mail), the neutrals are completely compatible. 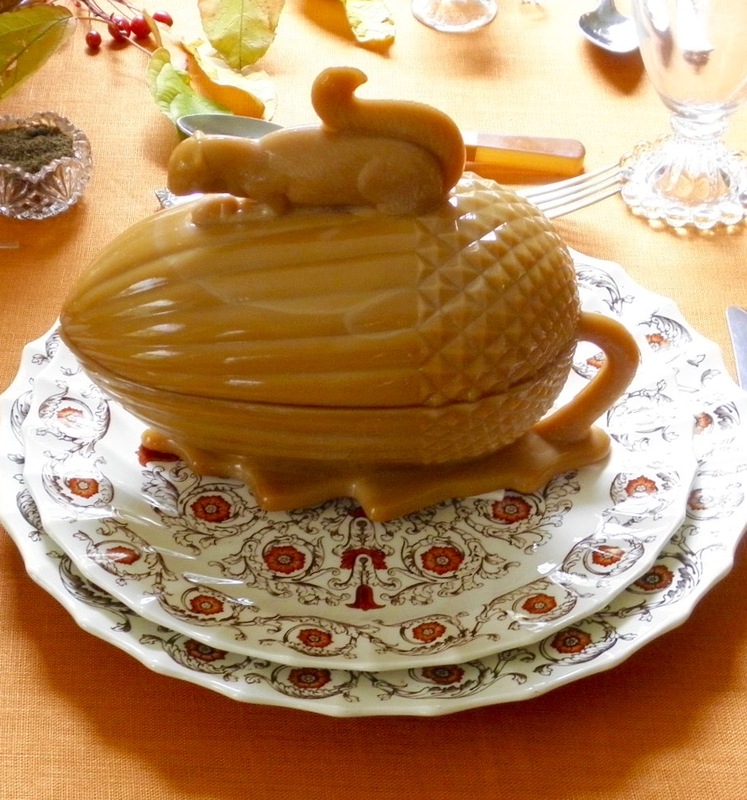 I love the Squirrel and Acorn covered dish. The prototype for this vessel came from the French glassworks, Vallerysthal, at the turn of the twentieth century. L.G. Wright Glass created this version from the 1940s through the 1990s. Soon after that, L.E. Smith Glass used the exact same mold from LG Wright, to produce the MBM ones. 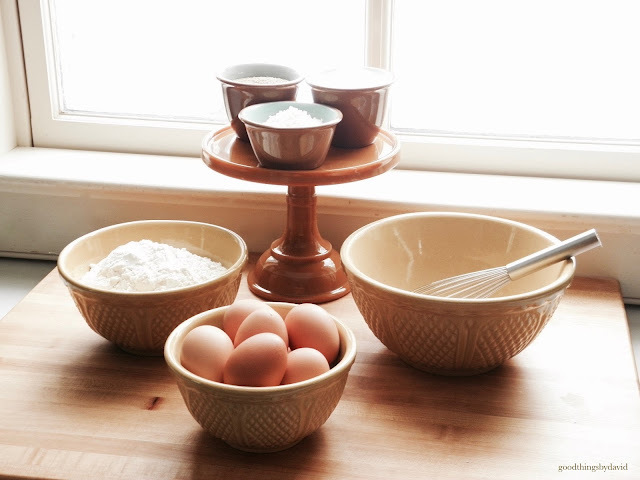 One of my bright, sunny spots in the kitchen has a trio of Diamond Stoneware bowls and a small 8" caramel glass cake stand. The color of the caramel glass from L.E. Smith, is nothing short of mesmerizing. People tell me that they almost want to eat the glass because it looks enticing. Between the both of us, I think Mosser Glass of Ohio needs to do a version of caramel glass. You don't need to be elaborate to present a beautiful cake for guests. A good cake stand and some confectioners sugar dusted on top with a stencil is all you need. 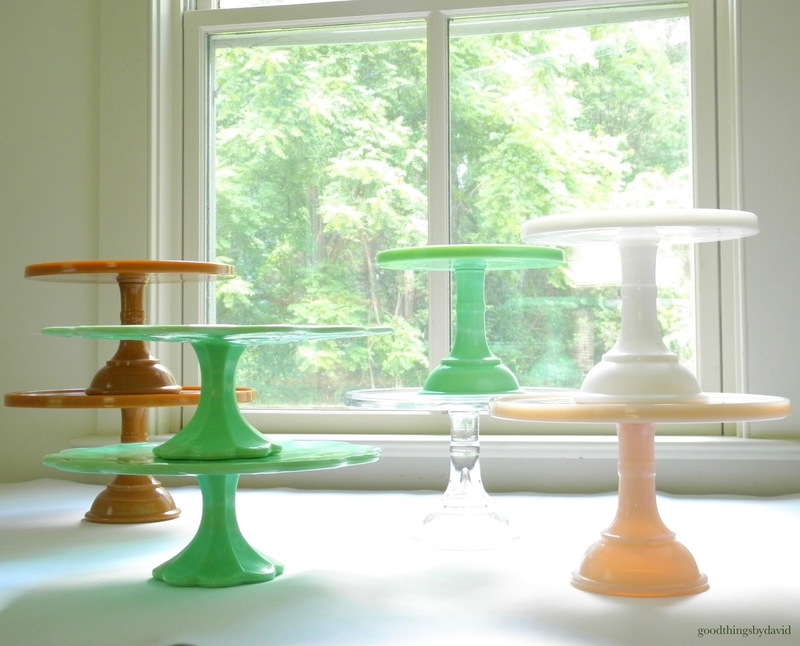 Some of my Martha by Mail cake stands here on the dough counter display the great colors of the pressed glass. The shell-pink is so adorable! 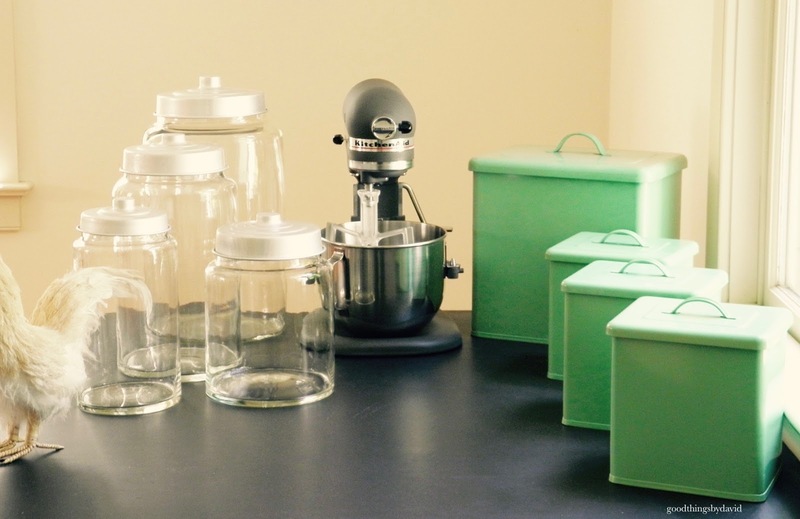 The highly sought after set of apothecary jars came in four sizes. The several sets of these that I own are used throughout the house. I have a set in the kitchen, a set in the laundry room and one in my home office. These were made from thick glass and were given aluminum lids. What I love about storing my kitchen staples in these is that they have wide mouths. 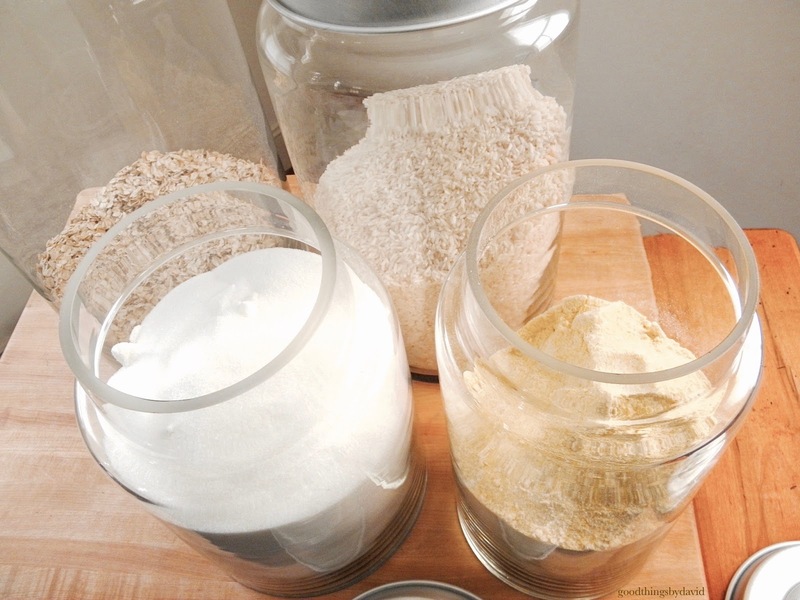 This allows me to scoop up ingredients with relative ease. 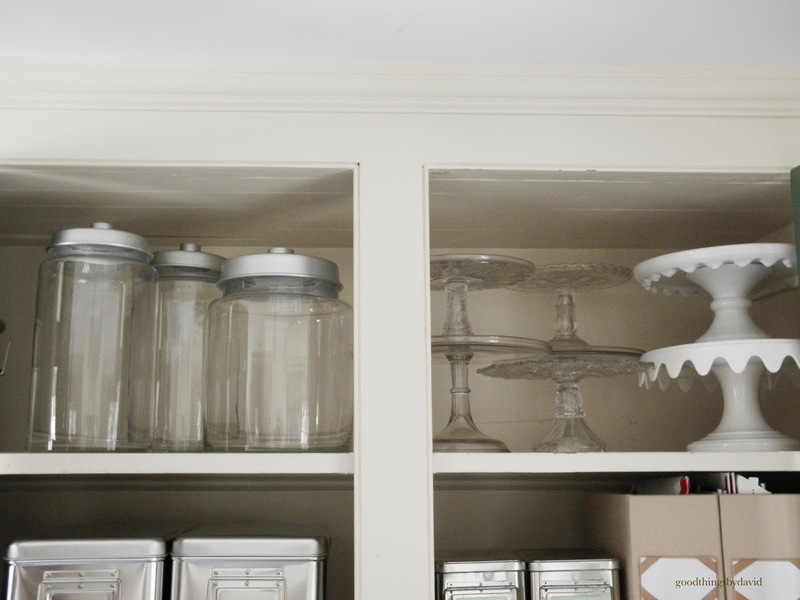 The very top shelf of my home office has a small overflow of apothecary jars and cake stands. It's nice to see that the MBM jars have been imitated by many retailers over the years. 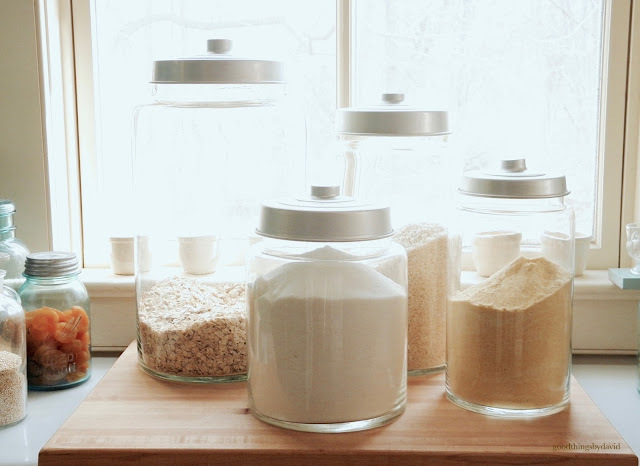 Whether you have the originals or some of the newer versions, storage jars like these are invaluable in one's home. 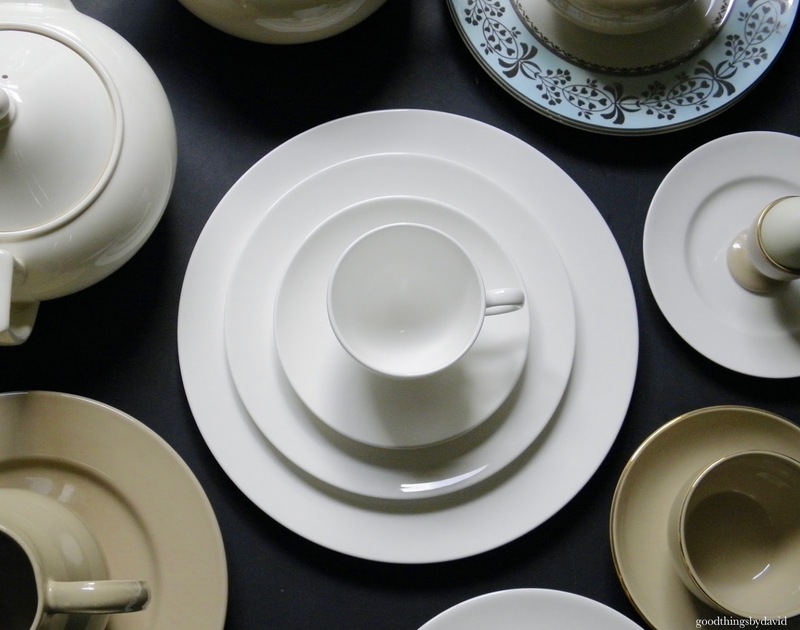 Fine china should be a part of every home. It's what we reach for when company is coming over or if it's a holiday. 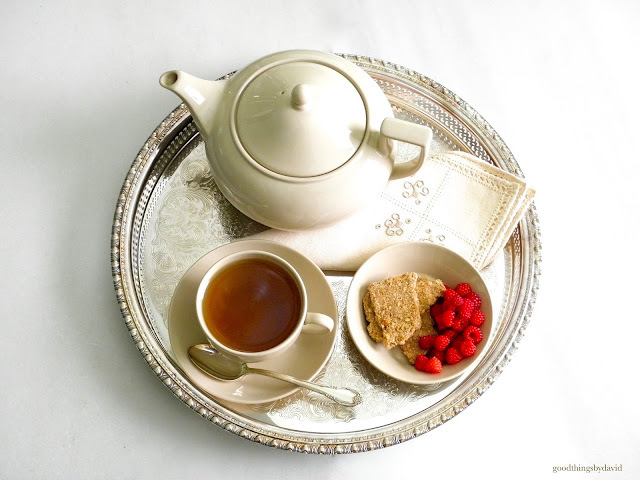 Fine china can be simple and white, or it can be colorful and heavily accented. What we decide to collect is entirely up to one's tastes and inclinations. 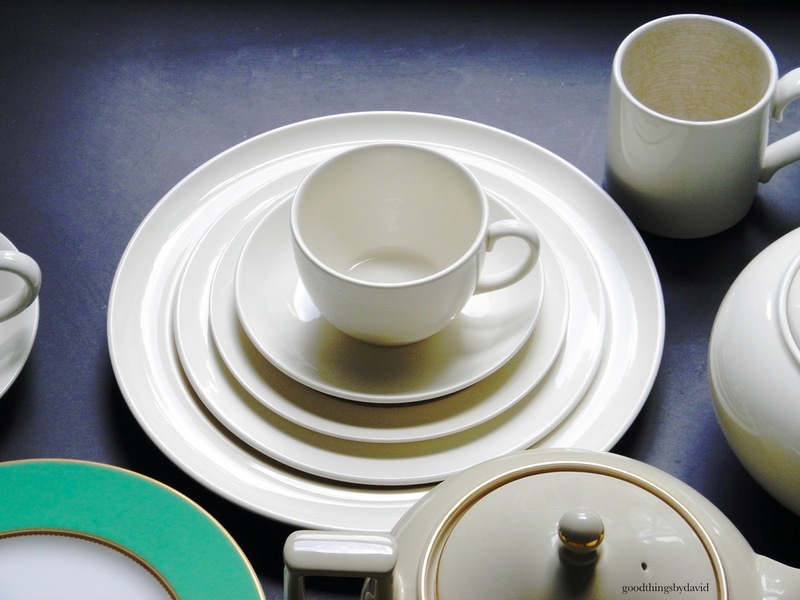 Martha by Mail knew the importance of incorporating fine china into a home. They worked with several important pottery works, both here in the United States and abroad, to bring back antique patterns, as well as to create their very own. I was immediately drawn to the various patterns from Wedgwood through Martha by Mail. I think that it was the neutral colors which captured my full attention. 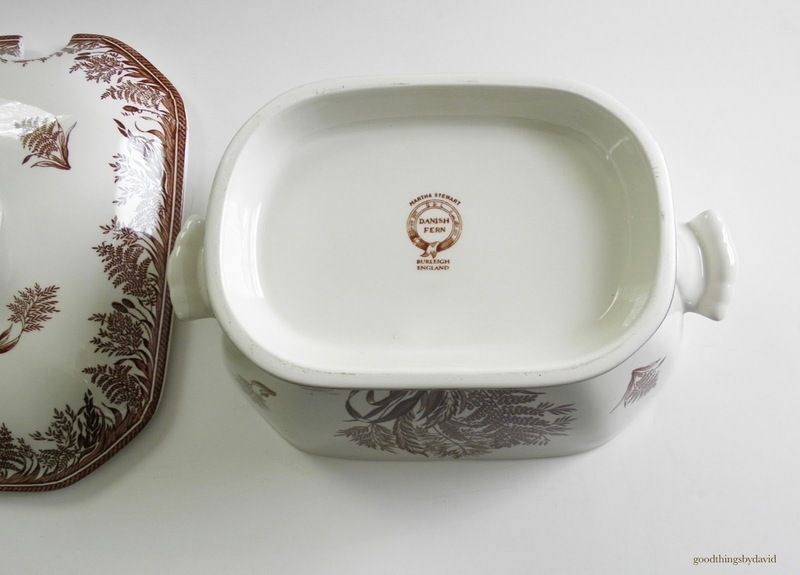 Danish Fern by Burleigh Ware is one that I failed to collect. I regret this to no end because it is a very beautiful line of transferware. Some of my friends have piles and piles of this china, and I have to say that I'm rather envious. This beautiful soup tureen went to a very good friend of mine. 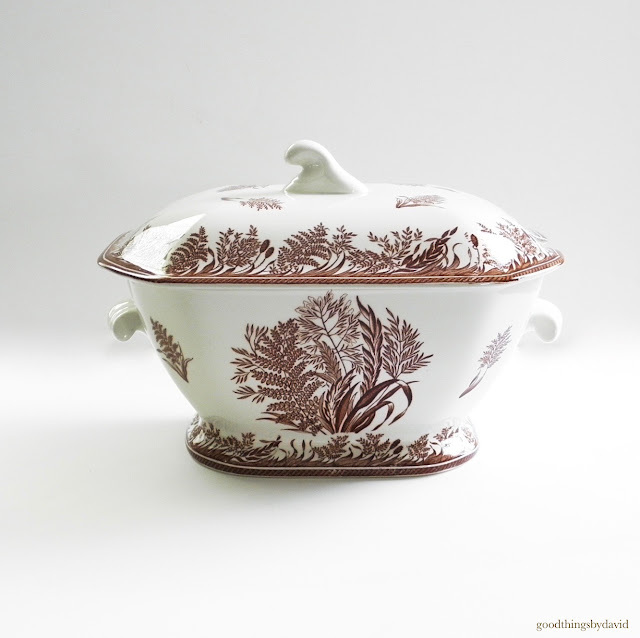 Pristine white ironstone was used as a canvas for the delicate Danish Fern transferware. Each piece was stamped with the Martha Stewart/Burleigh Ware hallmark. What I do happen to have in large quantities is Wedgwood Drabware from 2000. I've written extensively about this particular pattern in past posts, and I have photographed it to no end throughout the blog. 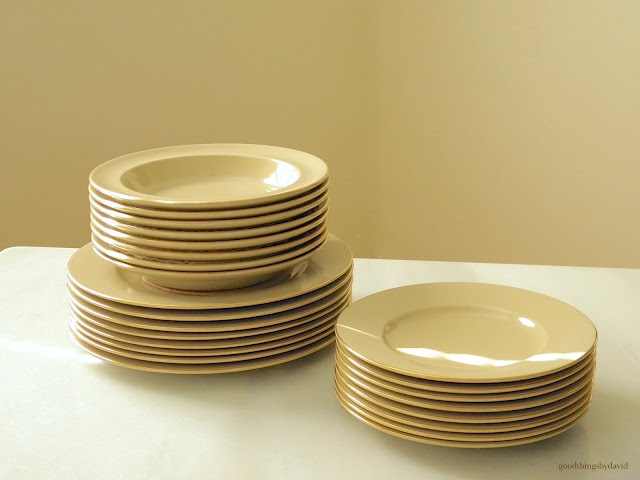 Drabware gets used during the week for either simple meals or for more hearty dinners. This overview of some of my MBM china shows you what I like. The only thing that didn't come from England or from Wedgwood is the Antique Star pattern (light green rim). That particular plate was made in Japan from very fine, delicate porcelain. It's one of my favorite accent pieces. White Burleigh Ware mugs and cups, creamy Wedgwood Queen's Ware, and earthy Drabware pieces will always seem fresh to me. As I was telling someone the other day, I can see these in another twenty or forty years being just as beautiful as they are today. Most of the bulk of my MBM drabware pieces are of the gilded variety. 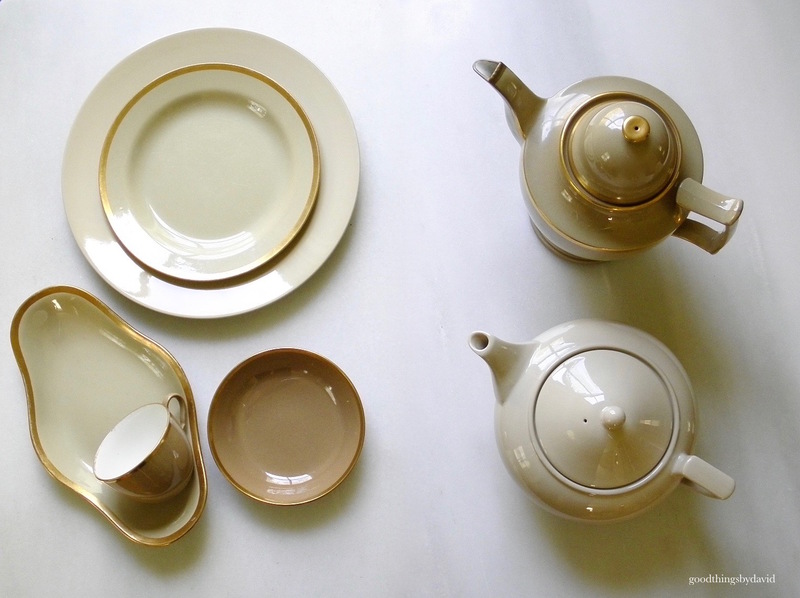 Teapots, teacups and other accent plates in plain drabware are part of my collection, but it is the gilded ones that are the preferred choice at chez moi. I love this pattern so much that several years ago I decided to gift my mother a service for eight. 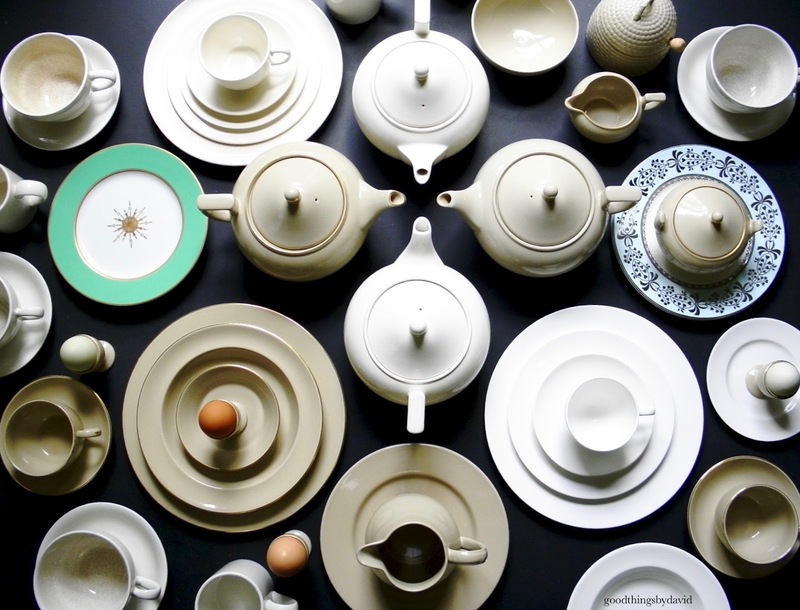 Transporting forty or so pieces of this china while flying to the west coast was no small feat. 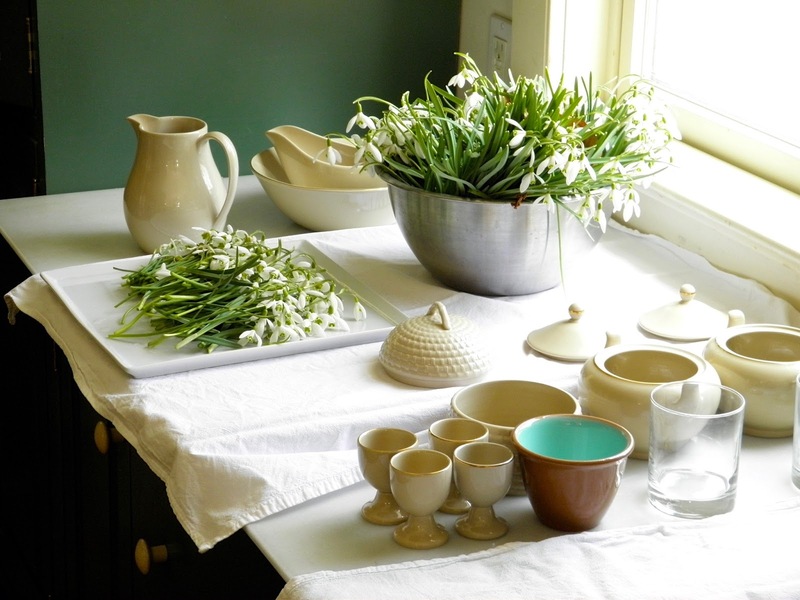 Eggcups, jugs and other pieces do get used from time to time for small flower arrangements. 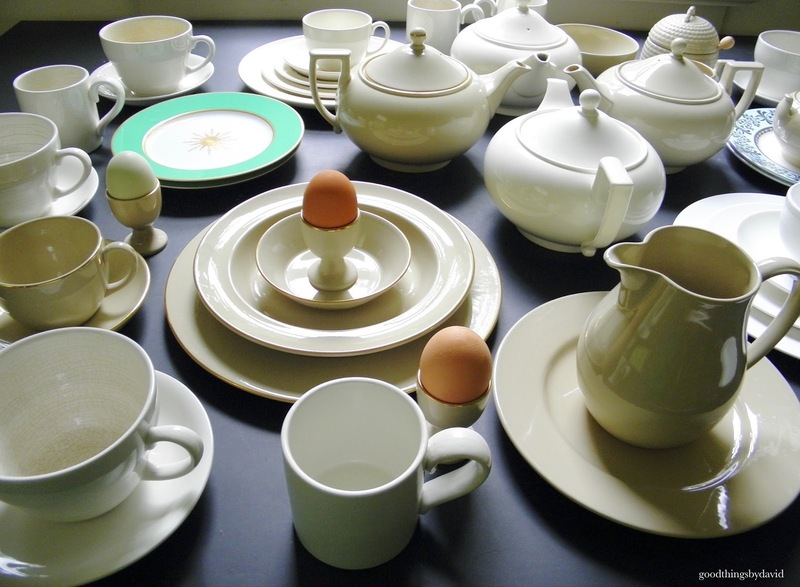 I took this photograph to show you how well the MBM pieces look with some of the older, antique versions from Spode and Wedgwood. White china should be in everyone's home. 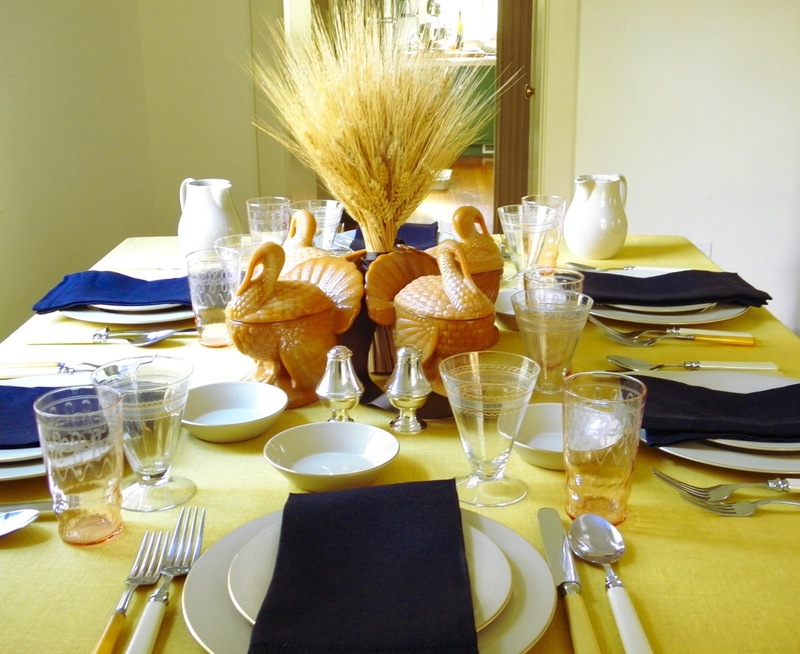 The white bone pattern (Leigh shape) from MBM is great for more formal dinners. It is very thin china, but I tell you that it is extremely sturdy. It's a shame I don't use it as often as I should. 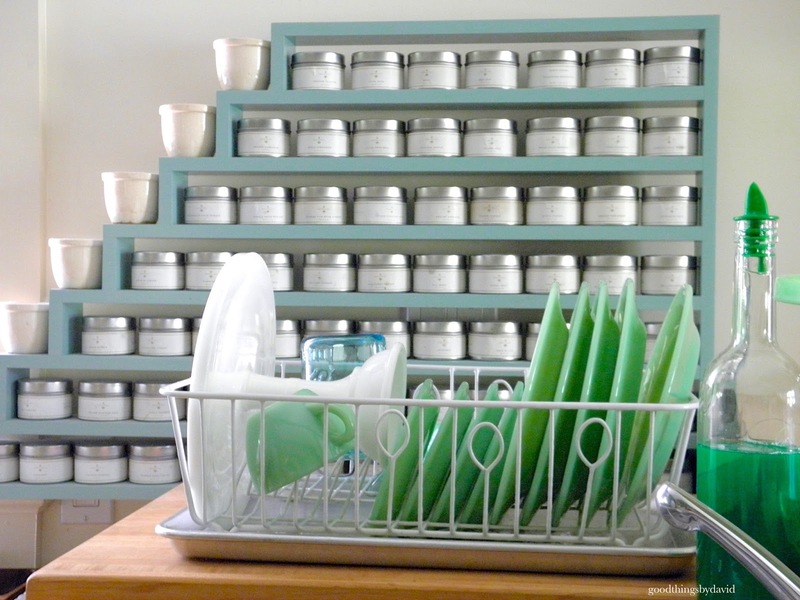 More for every day use is the MBM Queen's Ware (Traditional plain) pattern. These stoneware pieces are heavy and beautiful. They look good with just about every meal and every type of table setting. I use mine several times throughout the week. 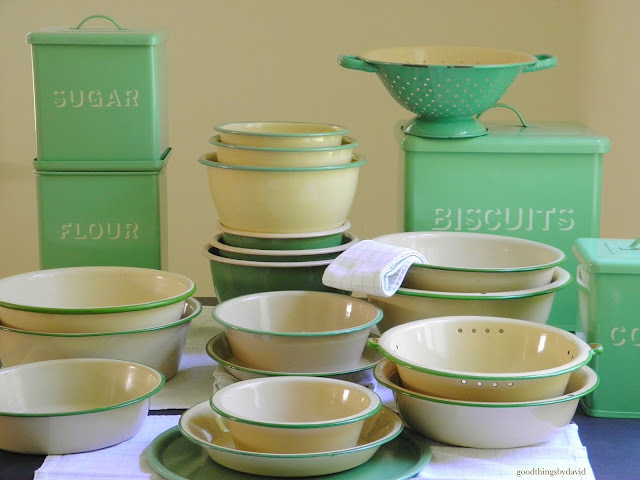 MBM offered a few pieces of enamelware. Personally, I think the catalog could have made a larger product line of some old pieces, but alas, it wasn't meant to be. 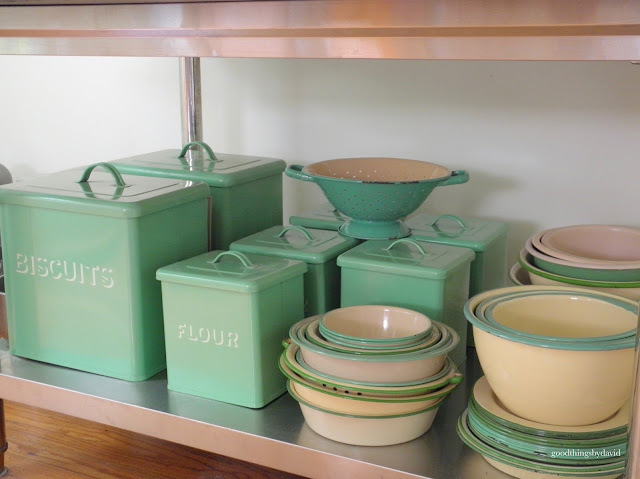 I love collecting the storage boxes/canisters that were offered in "Martha Green". That jadeite-shade of green looks so good next to my older pieces of cream green enamelware. 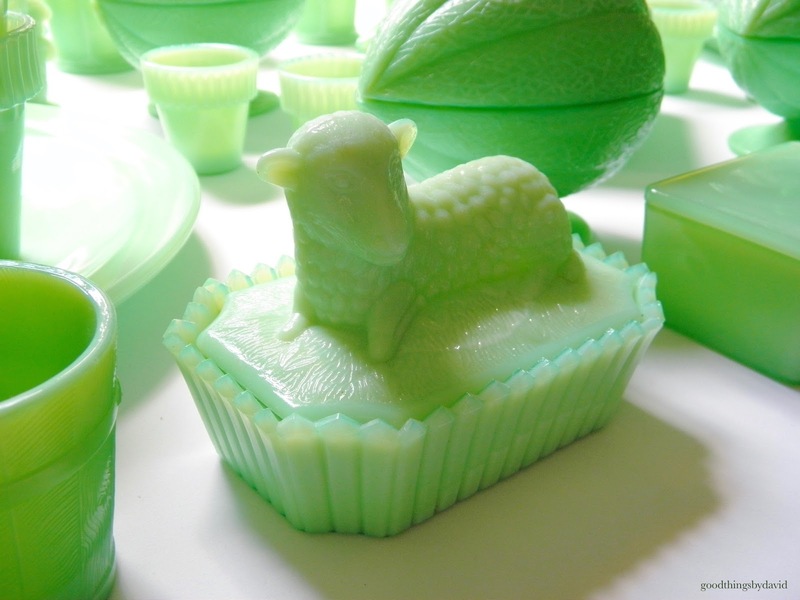 These were either stenciled or left plain, and came in white, green or a dark, putty color (think drabware). Underneath this commercial stainless steel table is a set of MBM storage canisters. I keep many things in these. Kitchen towels, vintage cookie cutters, cookie decorating implements and such, all have a place underneath this table. I know where everything is. 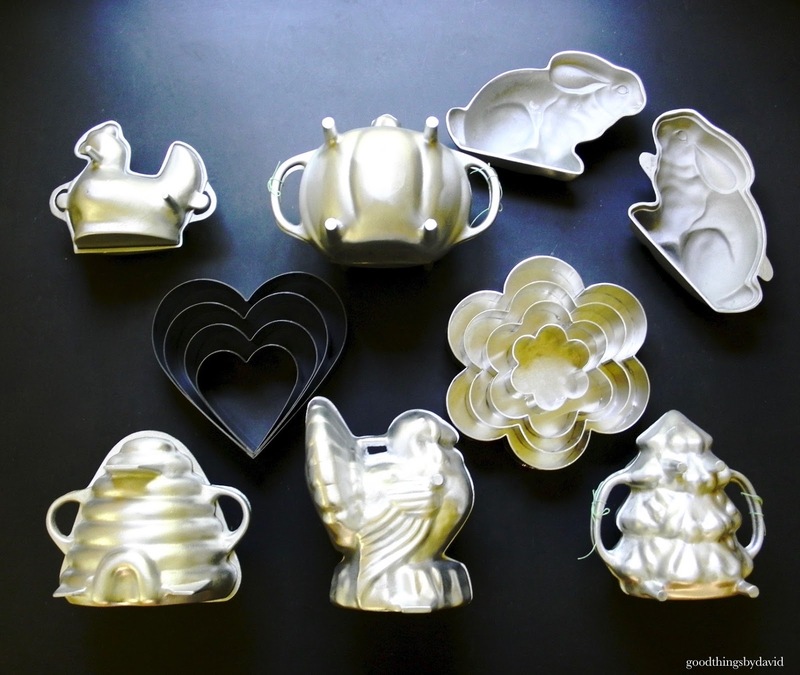 Several cake pans and cake molds were made exclusively for Martha by Mail. As much as I would like to have every pan from the catalog, I don't have the space for them. It's a modest collection, but I do love what I have. 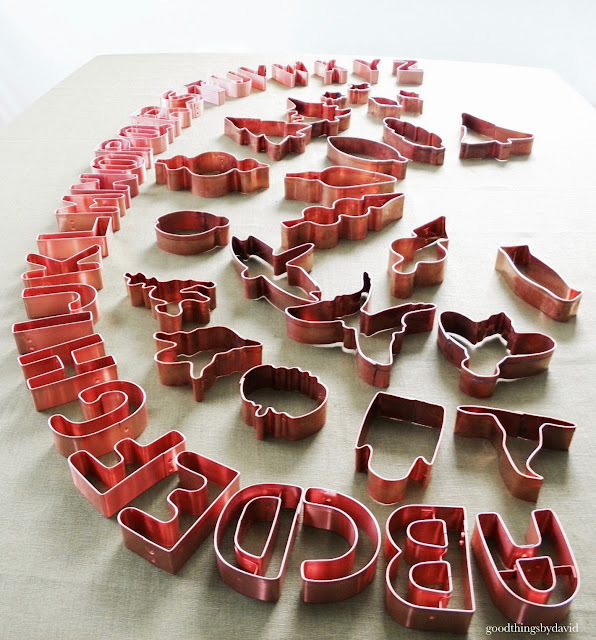 The lighter-colored molds are made from very heavy cast-aluminum. 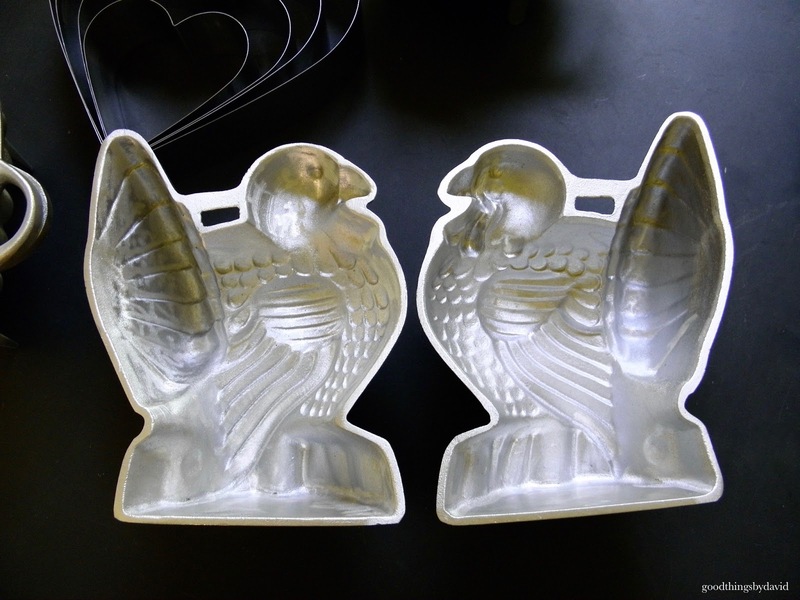 These two-part molds are meant to create three dimensional cakes in a variety of shapes. 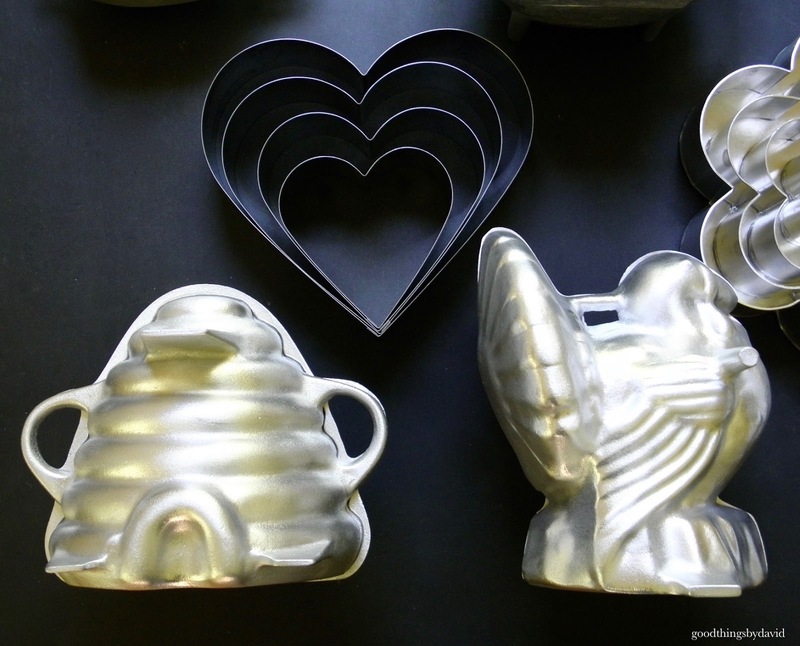 The petal cake pans can be used by themselves for single layer cakes or they can be used to construct a tiered cake. Three of my favorite MBM cake pans are pictured here. The beehive mold is one of those iconic pans that has been duplicated by Nordicware in a number of sizes. The large turkey has also been duplicated by this American company, making it easy to bake holiday cakes in the Fall. 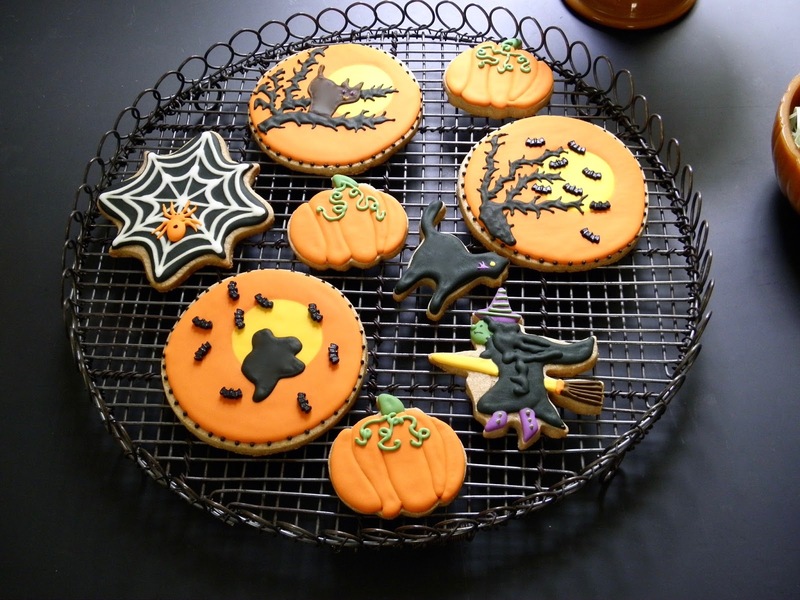 Those open-back cake pans/cutters can be used to cut sheet cakes, make large cookies (why not? ), but they can also be used to hold cake batters. 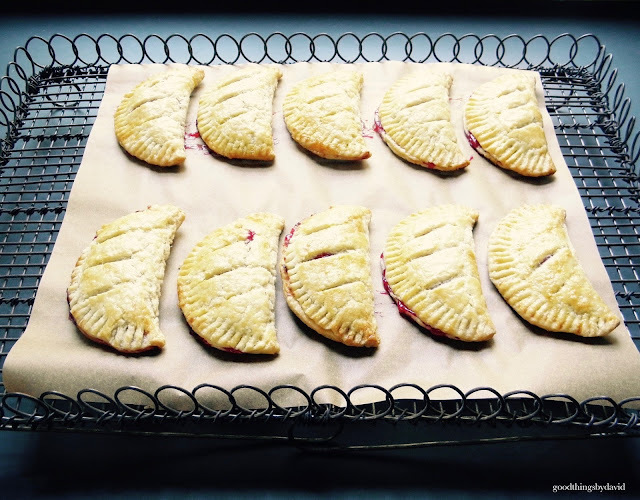 In order to do the latter, you must line the bottoms with parchment paper and aluminum foil (this gets wrapped tightly around the bottom of the pan). Bake as you would any other cake layer. You can see how detailed these molds are. 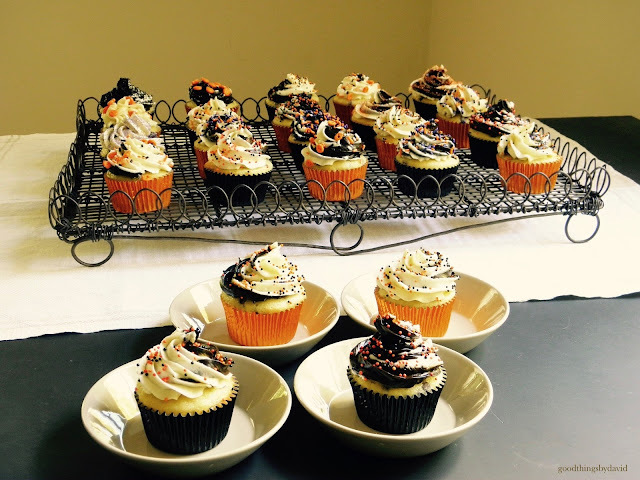 Left plain or decorated with icing, the finished cakes are definite showstoppers. 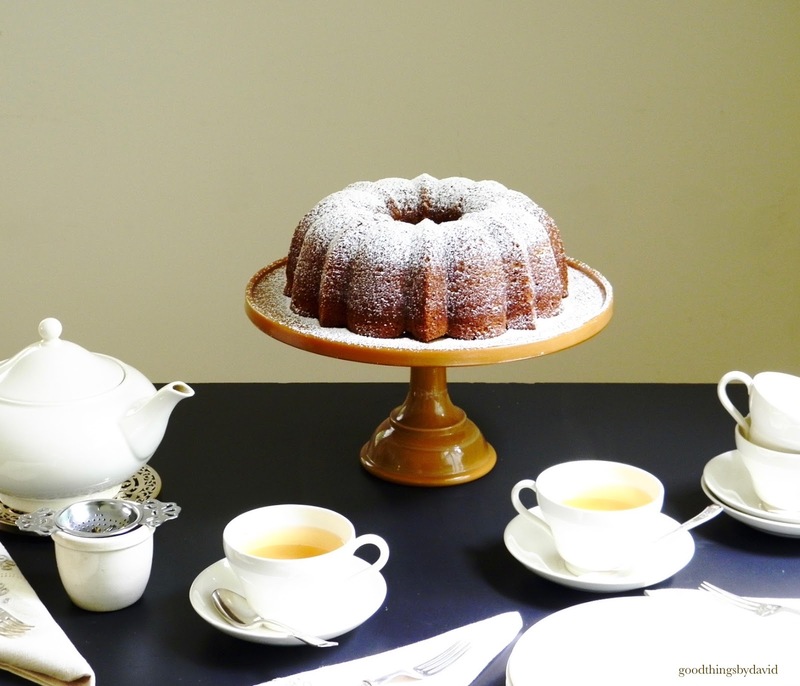 The bewitching pumpkin cake was made with the MBM pumpkin cake mold several years ago. 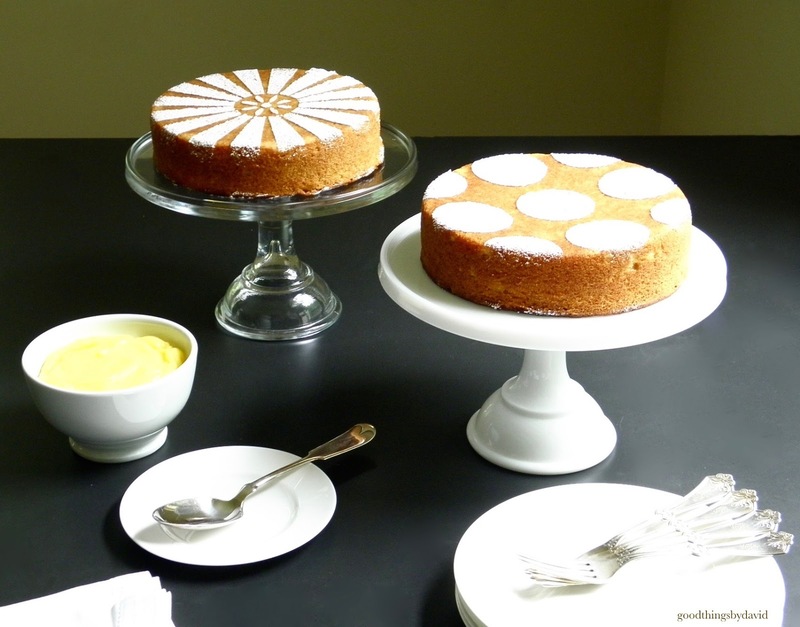 It looks perfect on the caramel glass cake stand. 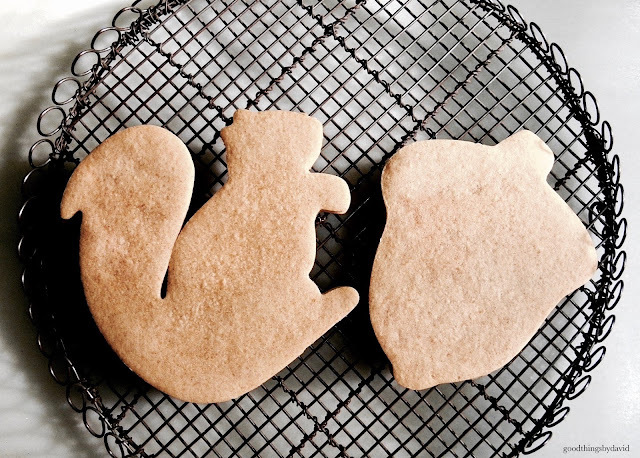 I happen to love baking cookies, icing cookies, giving away cookies, and devouring cookies. 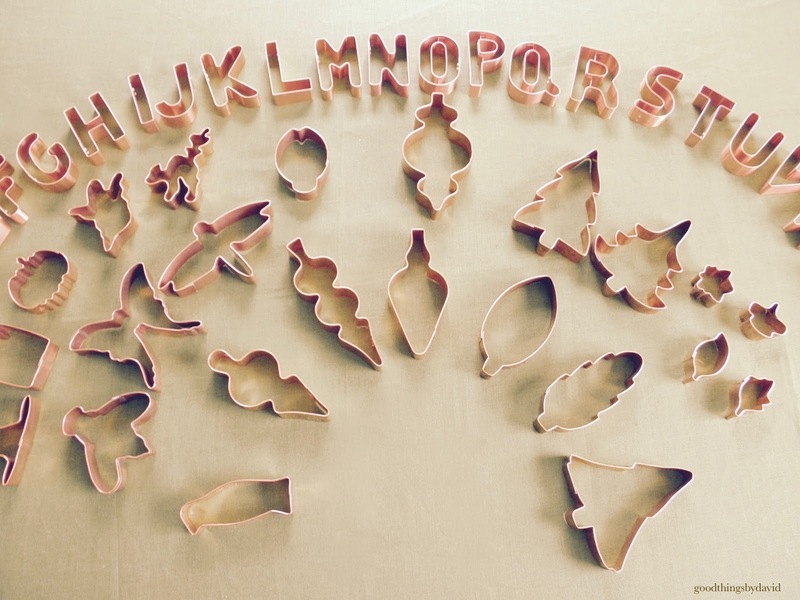 It's been that way ever since I was a little kid, so when I first began collecting Martha by Mail products, I gravitated toward the unique cookie cutters. 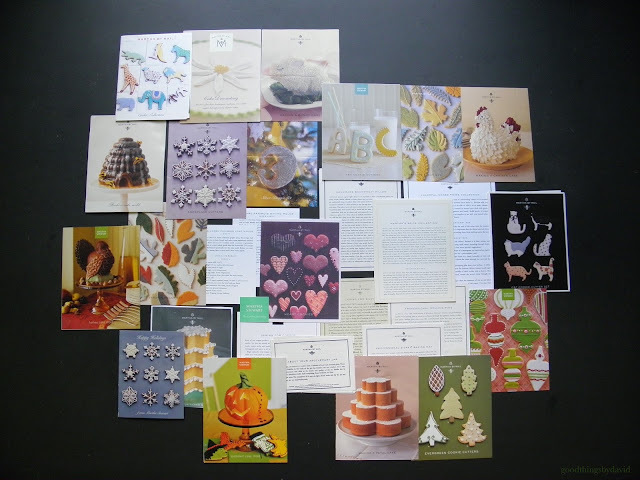 In the early days, I made sure to follow all of the instructions and recipes from those beautiful MBM cards so that I could perfect my craft. Although I wanted some of the earlier cookies to look perfect, I was patient with my initial results. I'm not one of those cookie cutter collectors that needs to have every single set that was sold through the catalog. I envy people that can be that methodical in their collecting. Evergreens, Beautiful Bugs, Canapé cutters, Halloween Marshmallow cutters and Victorian Ornament cutters are just some of the beautiful shapes that came out of the design team at MBM. The majority of the early copper cookie cutters, right through about 2002-2003, were made by the Michael Bonne Copperworks in Indiana. Skilled coppersmiths crafted thousands of cutters at the copper works, which many of us purchased. Their quality is apparent the moment you hold and use one. One can't mention Martha by Mail cookie cutters without talking about the large, closed-back cookie cutters. 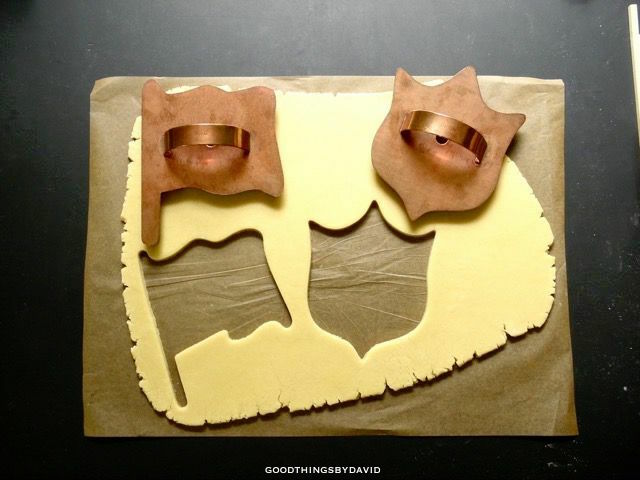 These gaint cutters were offered in themed pairs for the seasons throughout the year. 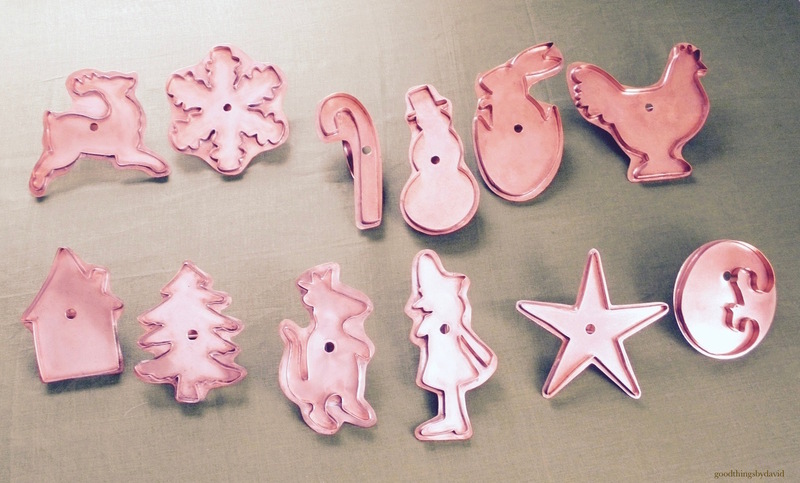 All of these cookie cutters are now deeply associated with Martha by Mail. The majority can be found online through auction sites, and if you're lucky, at estate sales and consignment shops. Some are more rare than others. Beautiful to own. A pleasure to use. 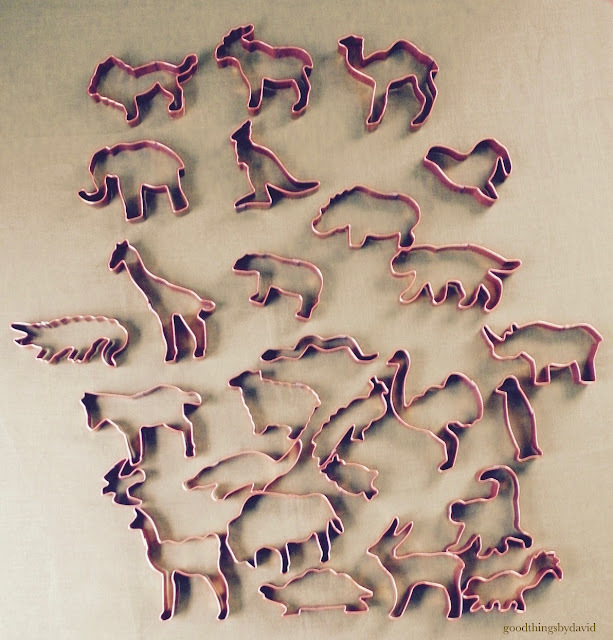 The design team at MBM came out with a series of Noah's Ark cookie cutters, which were sold as three separate sets. Here is grouping of the entire series. Go through my "Collecting" page at the top of the blog and look for the individual posts about these cookie cutters. 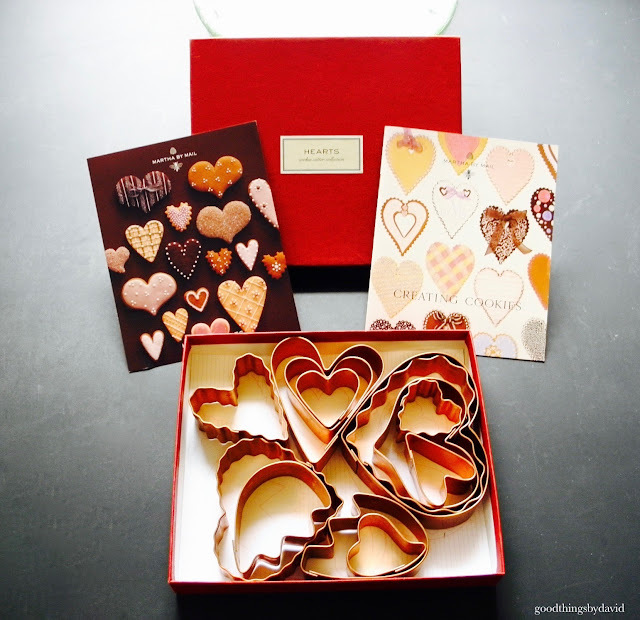 Among my favorite sets of cookie cutters from the catalog are the Hearts (set of 13). It's so much fun using these for Valentine's Day or for gift giving to the special ones in your life. You can never go wrong with heart-shaped sugar cookies. The Flag and Shield cookie cutters are among my top five favorite cookie cutter sets from Martha by Mail. I find these to be a bit rare these days. 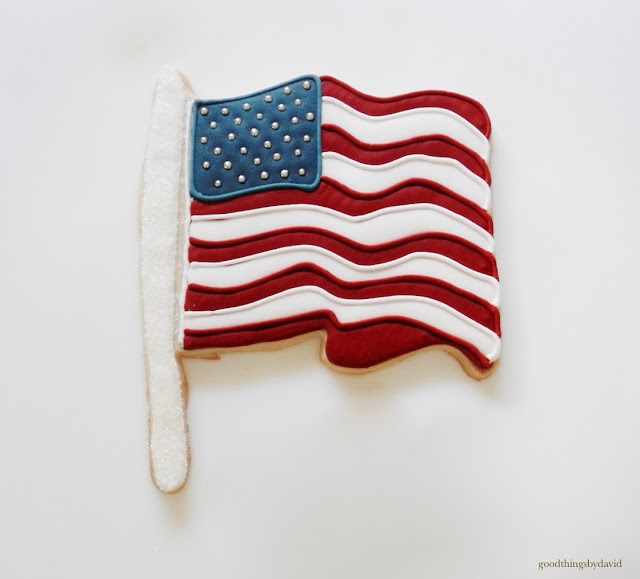 A large American flag cookie iced with tasty royal icing, and decorated with silver dragées, can be wrapped in a clear cellophane bag and be gifted to someone on Independence Day. 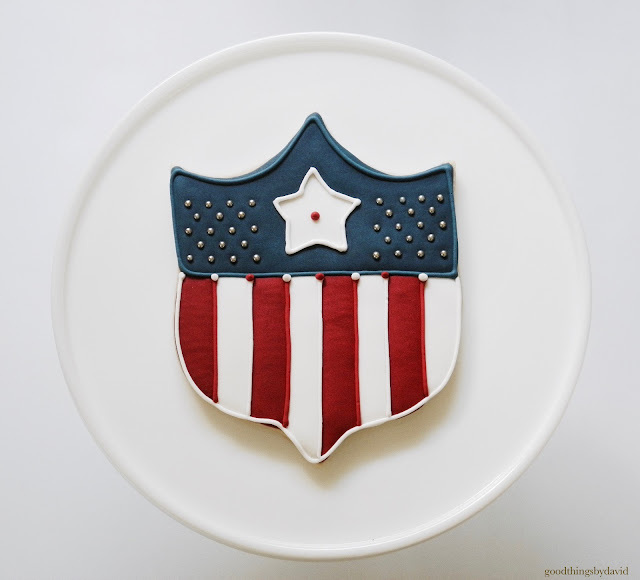 The large shield can be iced with the red, white and blue. However you decorate your cookies, honor our nation's flag and make them beautiful. From my home to yours, I hope that this overview of my favorite and most cherished Martha by Mail items, sparks your interest in the former catalog. I can't tell you how many readers reach out to me on a regular basis wanting to know information about a certain product or asking if I can point them in the right direction regarding Martha by Mail. I'm only happy to oblige individuals if they are sincere in their passion for these collectible items. Have fun collecting Martha by Mail! wow and wow. I am so envious but so excited for you. I looked at the same items over and over and couldn't wait to get the next little catalog. I did get a few things and love them. but, this! Thank you, JCP! Looking back, don't you wish you could have bought more? Keep and cherish what you do own. I'm so glad that you know the joys of owning MBM collectibles!! This is one of those posts... I want to read but I can't even start. I'm still taking in the photos! Love, love, love this post! Such an amazing and wonderful collection. What an exquisite collection! MBM only started delivering to Canada in 2002, and then it was only certain items that were eligible for delivery. Thank you so much for sharing this gorgeous collection! It's a shame that shipping to Canada was so limited for such a short period of time. If we could only turn back time. I love your passion for all things Martha! She has been a huge influence in my life as well and has taught me so much. Thank you for sharing your wonderful collections and why they are so special to you. Thank you for your kind words! I agree: she has taught millions of individuals so much throughout her career. If only they would reintroduce Martha By Mail at Macy's with the same quality. Oh I know. It's a shame because MBM really did their best to source some of this country's top manufacturers for so many products.